Off and on for the past couple of years, I've been working with nylon monofilament artificial muscles, trying to reproduce the results seen by professional researchers at a hobbyist level. My experience with the topic is strewn across a number of articles on this blog. Since there's been a fair bit of interest, I thought I would roll up everything I've learned so far into a comprehensive guide. Introduction: what are these things? In general, an artificial muscle is an actuator which produces motion by contracting or expanding along its length, or by rotating. Artificial muscles made of nylon monofilament were revealed in early 2014, when an inter-university team published the report “Artificial Muscles from Fishing Line and Sewing Thread” in the journal Science. As suggested by the title, nylon monofilaments are easily obtained by the layperson in the form of fishing line and nylon-core conductive thread. When the nylon is coiled in a specific manner and heat-treated so that the twists are made permanent, it becomes a muscle that responds to changes in temperature by (reversibly) changing its shape. Activation of the muscles can be achieved in a variety of ways. Blowing on them with a hair dryer or heat gun, immersing them alternately in hot and cold liquids, and putting them in contact with an electrically heated wire are all methods that have been used successfully. For an average or general application, I favor hot wire muscles as the least bulky, messy, and complicated of the possible options, so I'll be focusing on them rather heavily in the discussion that follows. Reading some of the articles about these devices could make you believe they're a miracle, but you shouldn't necessarily expect them to be the perfect solution for your robotics project. When compared to more traditional actuators like servos, they have distinct attributes that could make them an excellent choice for some applications, and a complete flop for others. Many of these would be common to thermosensitive artificial muscles of any type; a few distinguish nylon muscles from their chief competitors, shape-memory alloys such as nitinol wire. *Light. Their power-to-weight ratio is very good – exceeding that of human muscle tissue. *Slow. The muscles I've built take minutes to go through a full actuation cycle. Much faster cycle times have been achieved by others, but it seems that either immersion in water or active cooling (by fans, for instance) is required for best results. The thicker the nylon, the slower the heating and cooling process will be. *Inefficient. If you want good performance during the heating cycle, these muscles are rather power-hungry. *Environmentally sensitive. Since they are actuated by heat, nylon muscles will respond differently depending on the ambient temperature, requiring calibration and/or feedback if precision movement is desired. *Delicate and unreliable. It doesn't take a very high temperature to set the nylon into a new shape, so care must be taken when actuating the muscle to avoid its accidental destruction. Even high ambient temperatures (as in a closed house on a summer day) can sometimes do bad things to them. The research team that published the Science article used a type of filament called nylon 6/6. Supposedly this nylon grade is often used for fishing lines, but the packaging isn't going to be that specific – if you want to guarantee that you have real nylon 6/6, there's a good chance you will have to mail-order it, at additional trouble and expense. I opted instead to just buy some things and try them, and so far I have yet to find a type of nylon that doesn't work. I've used a couple of different fishing line brands, beading string, and even hedge-trimmer cutting line and gotten them all to actuate. One hitch to beware of is that not all fishing lines are made of nylon – the fluorocarbon type is also popular, and I've yet to hear of someone making a working muscle out of that. For your first experiments, I recommend a filament that is fairly thick, but not too thick. A 711 um diameter fishing line worked well for me, and continues to be my favorite thing to use. In my experience, thinner nylon is less forgiving – it's more likely to infuriate you by snapping during the coiling process if the tension you put on it isn't exactly right, and it's easier to overheat and destroy it when you start playing with your new muscles. However, I don't recommend the really thick stuff (deep sea fishing line, trimmer line, or 3D printer filament) for your first try either. 2 mm filament calls for a heavy weight to tense it during coiling, and if it should happen to snap or come loose, watch out for your eyeballs. It soaks up a lot of heat and is harder to get a response out of with the application of reasonable amounts of energy. So get a “happy medium” filament, and try the extremes when you're more experienced. If you're planning on including an electric heating element in your muscle, you must also choose an appropriate wire. The best wires have a resistance in a range that will give you about as much current as your power supply can safely offer. They also have to be as flimsy/flexible as possible, as any mechanical stiffness in the wire will present resistance to the motion of your muscle. I've done much of my muscle work at 5-6 V, with up to 1.2 A of current available. At this point in the parameter space, I've had the best success with very thin copper wires. Magnet wire – the copper filament you can get out of old motors and transformers – heats up well, but is unacceptably fragile. Nichrome (30 AWG) is on the opposite end of the spectrum: strong for its diameter, but not as good at quickly heating up and cooling off, and possibly stiff enough to impede its muscle. Wires made out of many individually insulated copper strands, such as tinsel wire and litz wire, are the best – reasonably resilient, with good heating and cooling performance. Unfortunately, they are hard to purchase in small quantities. Someone was distributing litz wire on Ebay at the time I went shopping, but the only tinsel wire I could find is the small amount I scavenged from a broken pair of headphones. Another possibility that I haven't personally tried is coating the nylon line in conductive paint. I was wary of this option because silver-based conductive paints run expensive, and the carbon-based paints/inks have a high resistivity as compared to thin copper wires, so I was concerned they wouldn't carry enough current for good heating performance at the voltages I was working with. A different problem with this approach was reported to me by @inventor42 on Twitter: the coating of paint is liable to crack, and a girdling crack anywhere along the length of the muscle will create an open circuit. The technique of using a silver-based coating for heating was successfully applied by the authors of a 2014 MIT paper. The paper notes that the coating must be even for good results. A failed muscle that has wound itself into horizontal "whiskers"
Perhaps the simplest of all options is the nylon-core sewing thread. It already has a heating element built in: just run a current through the conductive layer. Downsides include a limited range of thicknesses and a tendency to be expensive. I haven't used it myself, but it comes recommended by the original research. 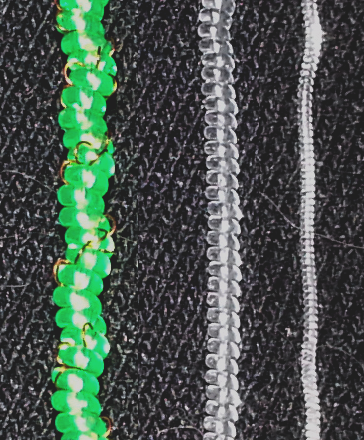 The coiling process for any nylon muscle proceeds in two stages. 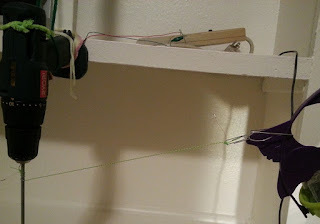 During Stage 1, the nylon is pinned at one end, and the other end is rotated, twisting the filament about its own center. Stage 2 forms the twisted nylon into loops. There are two ways of doing this. First, if one keeps the nylon under tension and continues twisting it after the manner of Stage 1, eventually it will begin to form itself into a series of densely packed, telephone-cord-like coils. 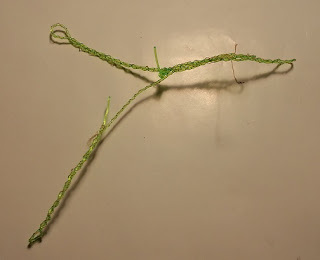 I refer to muscles made in this way as “self-coiled muscles.” Second, one may produce the loops manually by winding the twisted nylon around a rod. 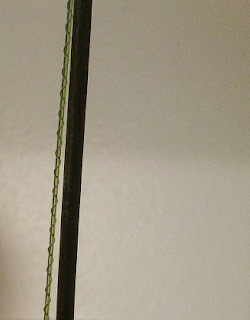 I refer to the products of this technique as “rod-coiled muscles.” The loops of self-coiled muscles have a predefined inner diameter that depends on the thickness of the nylon, while the loops of rod-coiled muscles have an inner diameter that is set by the size of the rod. The chirality of a muscle is also important. Muscles whose Stage 1 twist and Stage 2 loops are formed in the same direction are homochiral; they contract (shorten) when heated. Muscles whose Stage 1 twist and Stage 2 loops are formed in opposite directions are heterochiral; they expand (lengthen) when heated. Self-coiled muscles are always homochiral; rod-coiled muscles may be of either type, depending on which direction the maker chooses to wind the nylon around the rod. Multiply ℓ by a factor greater than 1 to account for the amount of length lost during Stage 1 twisting. 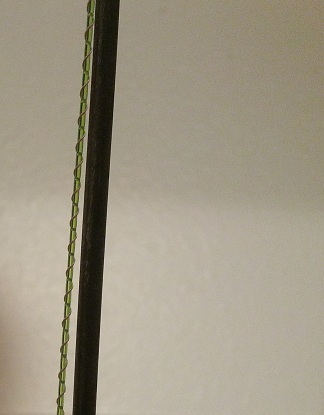 When I measured the Stage 1 length reduction for the 711 um Trilene Big Game fishing line, that factor was 1.154, but you may want to experiment with your own materials. The actual resting length of the finished muscle depends on the spacing between the coils, which you can adjust during heat treatment. If you are planning a self-coiled muscle, replace drod with the inner diameter of the naturally forming secondary coils. 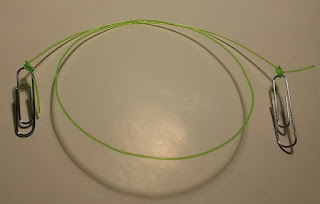 In my experience, this is always less than the diameter of the nylon itself; to get an exact value, you may need to make your first self-coiled muscle a test case to see how your particular nylon behaves. Make sure to cut at least 6 cm of extra nylon for “tails” at the ends of your muscle (these will not be part of its working length). Next, you will probably want anchors for the ends of your muscle. These will be going into the oven with the muscle later, so whatever you choose, make it something that won't burn or melt. I use uninsulated paper clips. Tie the nylon to each anchor with a sound knot and tighten it with pliers, leaving a good length of “tail” beyond the knot – the nylon will be under a lot of tension later, and it loves to slip. If you plan on including a heating wire, now is the time to add it. Cut your wire, tin the ends, slip each end through one of your anchor knots, and tie it around one of the loops of the knot. When you are finished, the wire should lie parallel to the nylon, and the length between the knots should be the same for nylon and wire. 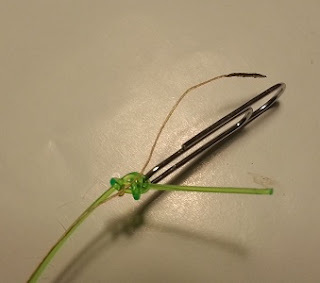 Some hobbyists complain about having difficulty soldering litz or tinsel wire. Since each strand is individually coated with enamel, the insulation can't be stripped, and must be melted off in order to tin the wire. I cover my work surface with an insulating pad and some glossy scrap paper that I don't mind scorching, and I press the end of the wire between the soldering tip and the paper for a few seconds. Then, maintaining pressure, I scrape the tip of the iron toward the end of the wire. If you're doing this right, you might see a visible streak of goo transferred to the paper (that's the enamel coming off) and the end of the wire should turn copper-colored and shiny. After a successful scrape, flip the wire over and repeat on the opposite side. Then coat the wire end in solder. Now you are ready to twist. The nylon must be put under tension in order to do this successfully. 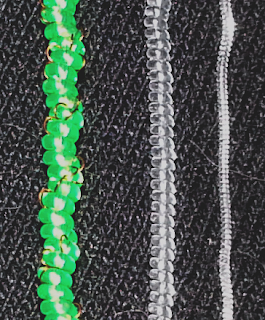 If you don't stretch the nylon hard enough during the coiling process, it will tend to form “whiskers” – by which I mean it will start bunching up into strange-looking coils that extend outward, perpendicular to the line, and become a useless mess. 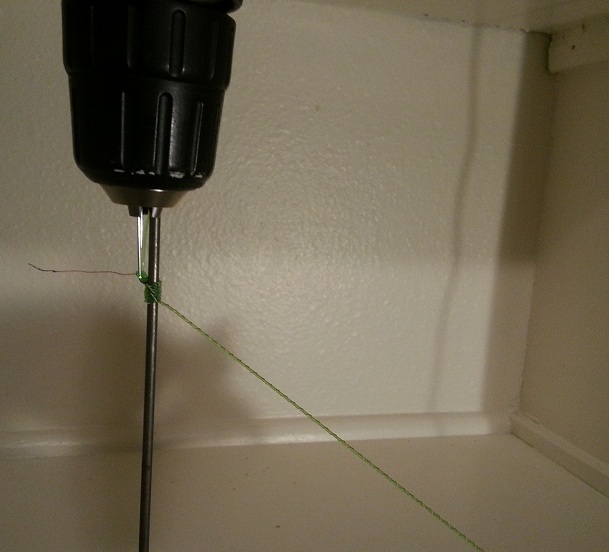 If you stretch it too hard, it will snap partway through coiling. The recommended coiling tension is 17 MPa (obtained from the original research paper). The thinner your nylon, the more tightly you need to adhere to this prescribed tension to avoid whiskering or breakage. Don't be fooled by the nylon's pound test rating (if it has one); during the strain of the coiling process, it will break while holding far less weight than that! Hang the tensioning mass from that convenient paper clip you put on the lower end of the muscle. You could simply hang the upper end from a fixed point and twist the muscle manually, but that would be very tedious. I strongly recommend some sort of motor to spin the upper end of the muscle, while the suspended weight is constrained with a horizontal stop so it cannot rotate. A power drill, fixed to a surface well above the floor, is ideal for the purpose. Clamp the anchor at the upper end of the muscle into the drill chuck, and you're ready to go. 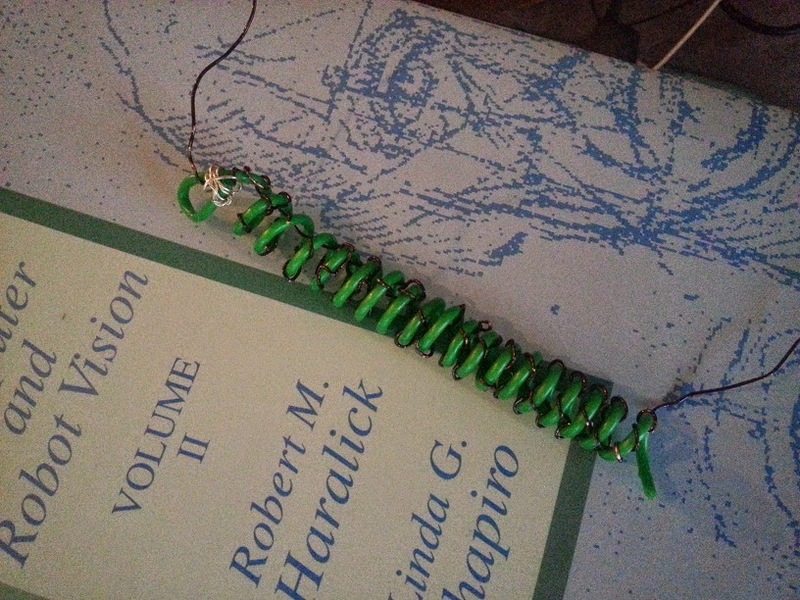 If you're making a rod-coiled muscle, you may also want to chuck the rod, but I'll get to that later. Self-coiled muscles are easy from this point onward. You just need to keep the drill going until the entire working length of the muscle has formed into a series of secondary loops. Self-coiled muscles will even “soft set” prior to annealing. When you remove the suspended weight and let go of the lower end, the muscle should relax a little and experience a small increase in coil diameter (possibly with a rather startling spin – watch for flailing paperclips), but it will hold its basic shape. If you want a rod-coiled muscle, some additional complexities come into play. For a rod-coiled muscle, you need to stop the twisting of Stage 1 before the muscle begins to self-coil. Doing this consistently is a bit tricky. You can count the rotations of your drill; the number you need will vary with the length of nylon you are preparing. You can time Stage 1 (this works best if you have a partner with good reaction time, and again, the time will vary with the nylon length). You can twist until the first secondary self-coil appears, then reverse your drill just long enough to undo it. Or you can visually check the candy-stripe pattern formed by the heating wire that might be part of your muscle; as Stage 1 twisting proceeds, the angle of the stripe will become more shallow, and you will see more individual stripes per centimeter of nylon length. When Stage 1 is complete, unhook the suspended weight from the lower end of your muscle. Hold on to it or it will untwist itself, form whiskers, or do something else stupid. Or else just lift up the weight with your hand, maintaining the existing tension. Near the end of Stage 1: heating wire "candy stripe"
Now the twisted nylon must be wound around the rod. 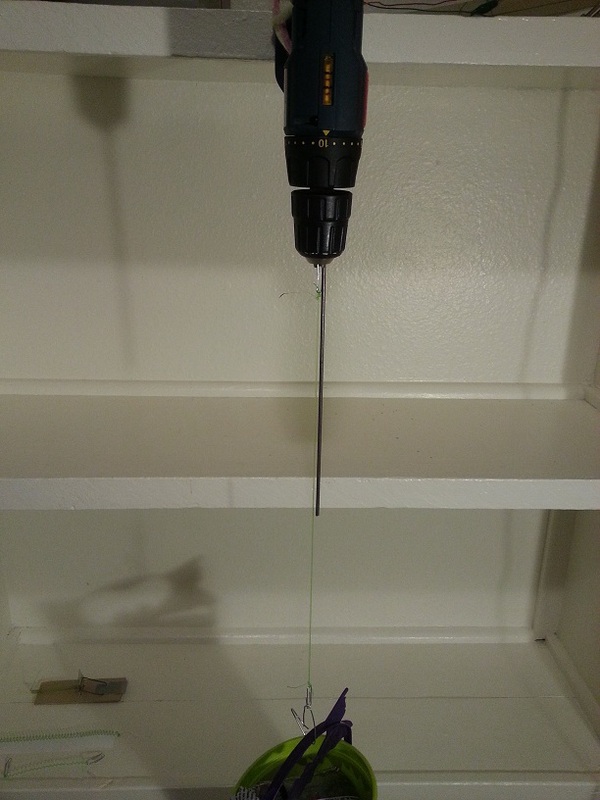 The best trick I've found for this is to start out by putting the rod into the drill chuck with the upper anchor. During Stage 1, it will lie parallel to the rod and get twisted up, without interacting with the rod much. When Stage 2 begins, you take the lower end of the nylon and pull it upward and outward – so that the nylon is now perpendicular to the rod – and start the drill again. This will automatically wind the nylon around the rod and give you nice, even coils. The direction you run the drill at this point determines whether you will get a homochiral or heterochiral product. Stand in front of the drill and note which direction the front face of the rotor turns during Stage 1. Supposing it moves toward your right, and you pull the nylon to your right when beginning Stage 2, and you keep running the drill in the same direction, your muscle should be homochiral. If you reverse the drill, it will be heterochiral. You can double-check by observing how the Stage 2 coils want to lie on the rod as they form. If they naturally pull toward each other and close-pack on the rod as densely as possible, it's homochiral. If they seem to repel each other, it's heterochiral. Homochiral muscle, Stage 2 winding. Angle the end downward for best results. Heterochiral muscle, Stage 2 winding. Angle the end upward for best results, and push the coils together on the rod every so often. They don't want to close-pack, but you should try to get them as close together as possible. Once your muscle is wound, you need to secure it to the rod so it can't come undone. 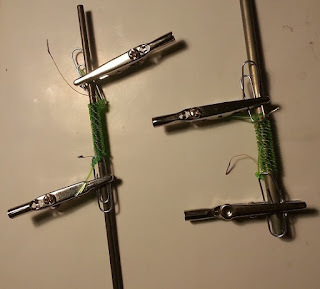 I clamp the paper clips to the rod with alligator clips. Again, this whole assembly will be getting very hot, so don't use anything that can't take it. When you are finished winding your muscle, I recommend doing a continuity check between the two ends of the heating wire before proceeding to heat treatment. It can snap in the middle without your noticing. Now the muscle must be annealed (heat-treated so it will hold its new shape). The recommended temperature is about 150º C (300º F), and the muscle should be kept at this temperature for many minutes. I bake mine for at least 20 minutes; longer does not hurt. Once you've twisted your muscle, you may be able to anneal it in place with a heat gun, but I prefer to put them in my toaster oven. I set the muscles up in the little pan that came with the oven, such that no part of the muscle touches the pan's bottom or sides (you wouldn't want uneven heat transfer to produce irregular results). Oven dials are unreliable, so check the actual temperature of your oven with a kitchen thermometer or calibrate it with sugar to see what you're really getting before trying to make muscles. If the oven has a preheat function, use it, and make sure it's up to temperature before putting the muscles in; if it doesn't, let the oven soak for a while after you turn it on. (I wait ten minutes before introducing the pan with the muscles in it.) When annealing is finished, remove the muscles from the oven and don't touch them until they are cool. If you've made a rod-coiled homochiral muscle, you must now ask yourself whether you would like to spread the coils. If you recall, homochiral muscles contract when heated, and they naturally form with perfectly close-packed coils. But if the coils are all right next to each other, there's nowhere for the muscle to contract to … which means it can't work unless it is put under tension. Depending on your application, you might want there to be some space between the coils when the muscle is at rest, even if it is not under load. To achieve this, you can stretch the muscle apart on the rod, position the coils evenly with your fingernail, and return it to the oven for a second annealing phase. I don't recommend trying to spread the coils before the first annealing phase. The muscle is under fierce tension at this point and will rebel against you, so you may end up with an ugly-looking and inefficient monstrosity. When annealing and cooling are complete … you have a muscle! Slip it off the rod (if necessary) and put it to use. A muscle may tolerate a larger current than the holding current for a short period of time, when it is first beginning to warm up. In fact, an initial high-current spurt is probably desirable to make the muscle heat quickly, reducing response time. Thus the control scheme should focus on providing this initial surge to bring the muscle up to the holding temperature, without producing a large overshoot that will damage the muscle. Precise position control almost certainly requires feedback; I have not attempted this myself, yet. The load a muscle can actuate depends on its material and form. In general, thicker nylon yields stronger muscles; there is also an inverse relationship between load capacity and rod diameter, for rod-coiled muscles. All else (e.g. coil spacing, load) being equal, rod diameter also affects the maximum deformation as a percentage of the muscle's length, with large-diameter muscles being able to move farther; thus the diameter of the rod can be used to trade actuation distance against actuation strength. For a detailed examination of this trade-off, see Artificial Muscles VI. Note: the Science paper that started all the hoopla is behind a paywall. 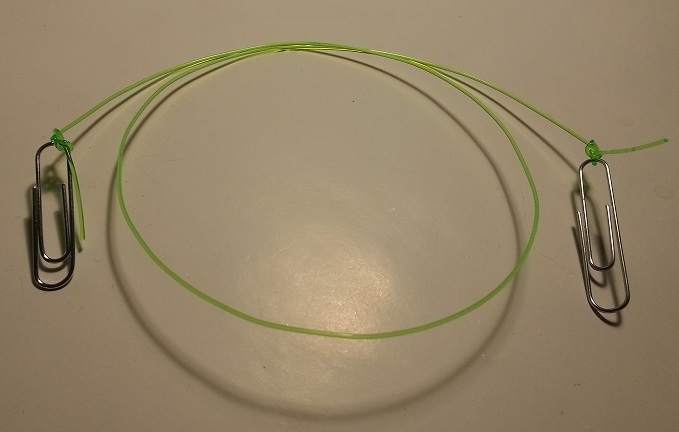 Fishing line artificial muscles are fabricated by coiling polymer filaments. We may call such a kind of actuators as coiled polymer actuators (CPAs). In this paper, a CPA is made from Nylon fishing line and Ni-Cr alloy (Nichrome) wire is wound around it. Taking account of the physical principle, two first-order transfer functions are introduced in the proposed model. The parameters of the model are estimated by the system identification. Finally, a 2-DOF PID controller is designed and the position control of the voltage-driven CPA is demonstrated in the experiment. Why not utilize heating and cooling via an outside source- such as a dual-mode hair-dryer? That way, so long as the source air can be shifted from a cooler source than the wire is used to, both heating and cooling can be expressed. It's a good idea for demos. In an application, though, if you're trying to use artificial muscles as a motor replacement, adding a fan or blower back into the system to help actuate the muscles kind of defeats the purpose. A rather simple question for you, please... Once you have a self-coiled sample, do you release it from the apparatus and allow it release some of the tension before you put it in the oven for annealing? Or do you keep the coiled muscle under tension and anneal it with out allowing it to relax? I release the self-coiled muscles from tension before annealing them, simply because I haven't found a practical way to keep them tensed while they go through the oven. I had tried your method by a making rod-coiled artificial muscle but i couldn't make it. Could you show me a video how to wind an artificial muscle on the rod? Thank you so much. Please Date your posts. Without a date they are much less useful. can someone help me out, I've been trying the mass tension formula for the past 2 hours and cant reach a conclusion that makes sense. Please if anyone can make sense of this that would be awesome. It's a basic pressure equation: F=pA, force = pressure * area. Since we're told to plug in 17MPa for T, we're working in SI units. The pascal is defined as one newton per square meter, so your area is in square meters. πr^2 is the area of a circle, so r is in meters. One newton is the force needed to accelerate one kilogram of mass at the rate of one meter per second squared in direction of the applied force, so F=mg, force=mass*the acceleration of gravity (9.81m/s^2). We know the force and want the mass, so the equation was rearranged to m=F/g. See my other comment addressed to you for an example. Jakson, r is the radius in meters. T is in Pascals (17MPa=17,000,000Pa). g (gravity) is 9.81. m is in kilograms. 198 grams agrees with the mass given in the table in Nylon Fishing Line Artificial Muscles II. which is quite close to the maximum efficiency of 1.08% attained by Haines, et al. RoboChicken will need a car battery, which makes him a bit too heavy to fly.